· Take Route 476 (Blue Route) South to Exit 3 (Media/Swarthmore). · Turn Right heading on Baltimore Pike South. · Take Baltimore Pike for 3 traffic signals to Route 252 South. · Turn left on Route 252 South (Providence Road). · Take 252 South for two lights and turn right on Brookhaven. · Right on Brookhaven Road to Waterville Road on left (just before Rt 352). · Left on Waterville Road approximately 1 mile to 5th left at Harvey Road (sharp left). 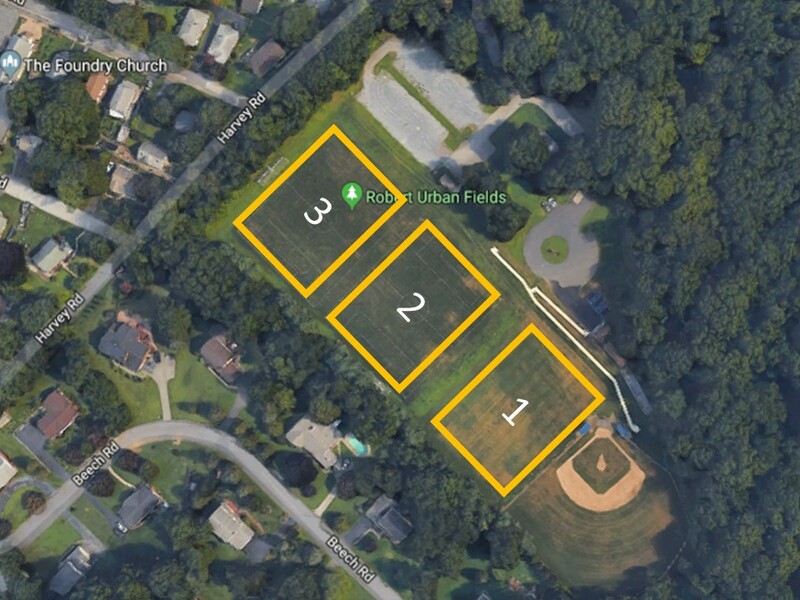 · Follow Harvey Road 0.3 miles to entrance on right to Field of Dreams, aka Robert Urban Fields. · Take Route 476 (Blue Route) North to Exit 3 (Media/Swarthmore). · Turn Left heading on Baltimore Pike South. · Take Baltimore Pike for 4 traffic signals to Route 252 South. · Take Route 1/Baltimore Pike North to Route 252 South. · Turn right on Route 252 South (Providence Road).